Remember the “old days” when school desks were wooden chairs with a half desk top attached? For those who were tall, you could never get your knees under the desk tops, let alone cross your legs. 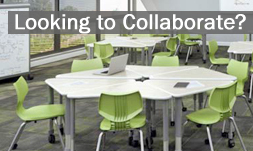 Read about how matching furniture to function can help students maintain the focus they need to succeed at school. Educators and school designers place a high priority on creating facilities that enhance learning. That applies not only to how a school is built, but also to the materials and equipment used. Just as acoustical treatments or well-placed windows and skylights can make a classroom more conducive to learning, so can the right furniture. Desks, tables and chairs that improve the educational environment can help students maintain the focus they need to succeed at school. Yet in many schools, the desks and chairs in a classroom do not match the students that use them. The resulting discomfort and fatigue can prevent students from concentrating on their work and over time can lead to eye strain or injuries to legs, wrists and necks.